電腦領域 HKEPC Hardware » 系統組件 » 剛睇到報導，AMD 3系底板唔支持黎緊新出既新U!! 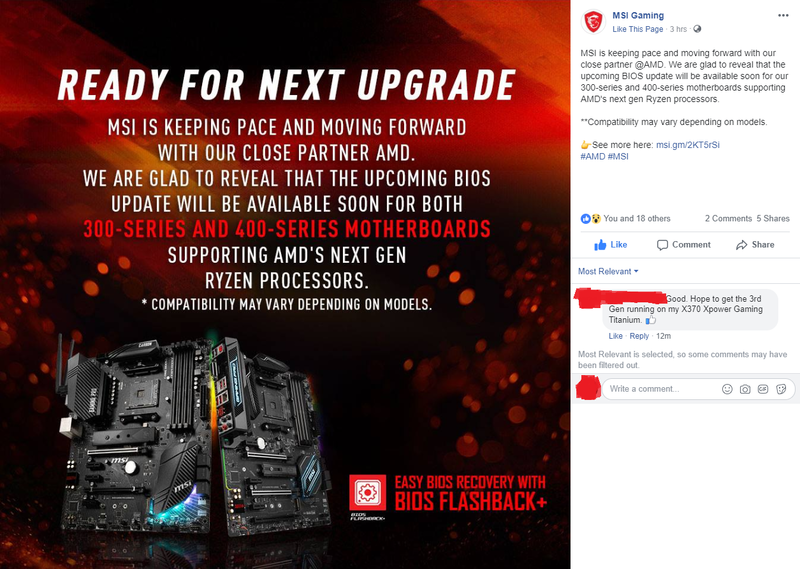 It has come to our attention that MSI Customer Support has regrettably misinformed an MSI customer with regards to potential support for next-gen AMD CPUs on the MSI X370 XPOWER GAMING TITANIUM motherboard. Below is a full list of upcoming BIOS versions which include compatibility for the next-gen AMD APUs for our 300-Series and 400-Series AM4 motherboards based on the latest AMD Combo PI version 1.0.0.0. MSI 出來清澄咗. 有個list話test咗. 大部份都support 新U. GMT+8, 2019-4-18 23:09, Processed in 0.133440 second(s), 4 queries.